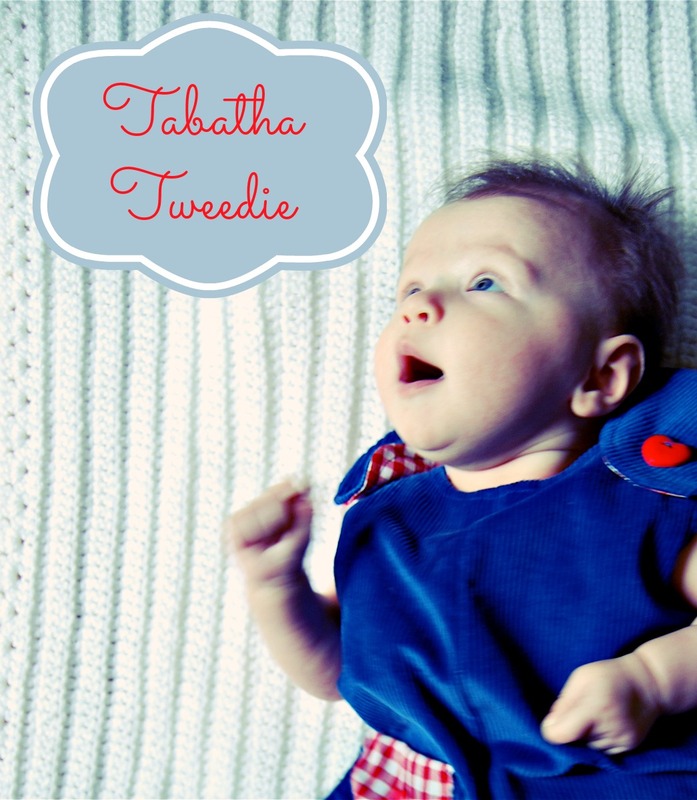 Congratulations Tabatha Tweedie! 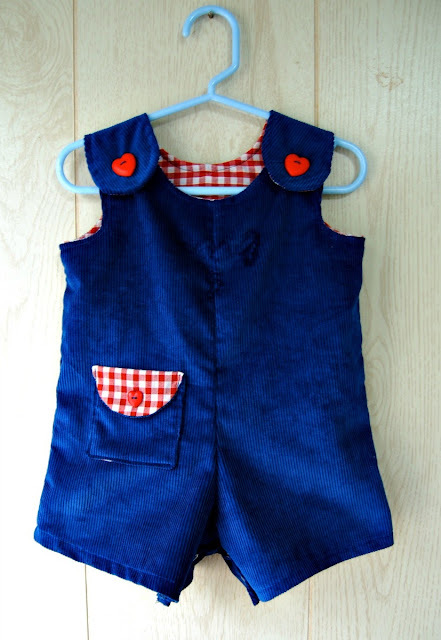 I can't wait to see your sweet little one in those car dungarees. 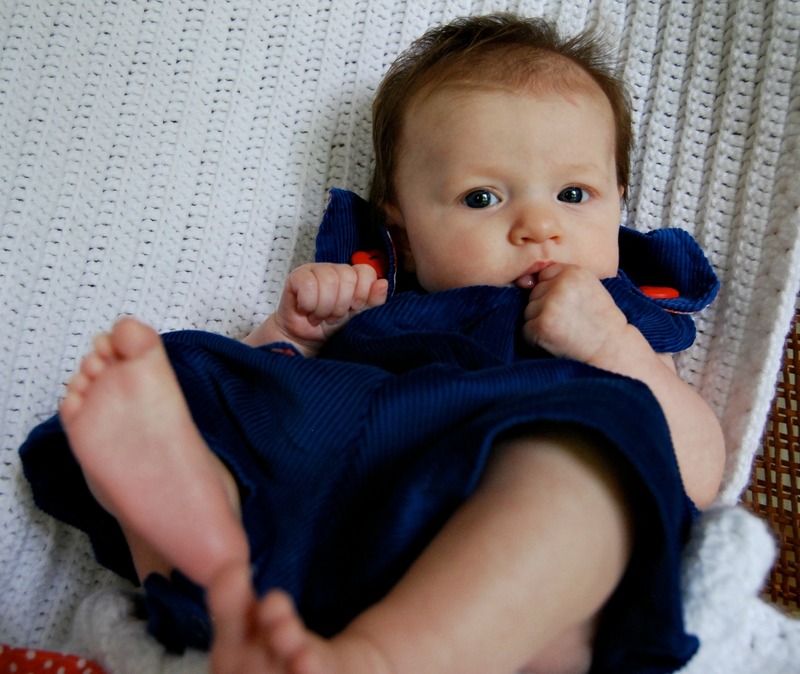 Look out for an email from Little Dress Kits. Thanks for playing, everyone! Gone are the days of me zipping out of the house to pick up some notion I need to finish a project. I can't tell you how hard it is to get baby Jane out of the house. It takes a couple of hours of planning and making sure I get the feeding schedule just right. And it never fails- as soon as I get my act together, load up all of her stuff and snap baby Jane's car seat in the car, she poops. Then we're back inside to change a diaper and start over. It's like a comedy routine. Katie of Little Dress Kits contacted me a few weeks ago to try out one of her kits and offer a giveaway. (That's my kit creation above, complete with a drool spot a la Jane.) I was so excited because it had been about six weeks since I'd been out of the house and to the fabric store. I'd only been dreaming of sewing and starting a new project. I was stoked to learn about her business. 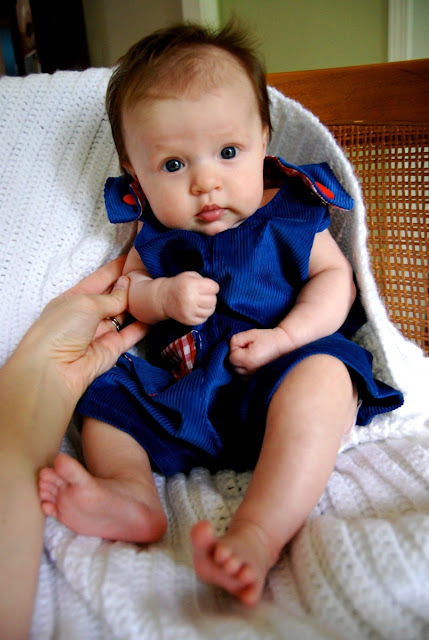 Katie started Little Dress Kits to provide beginner sewists with everything they need to create an article of clothing from a pattern. No reading the back of a dress pattern, trying to figure out what all the terminology means and then searching the fabric store for all the right materials. 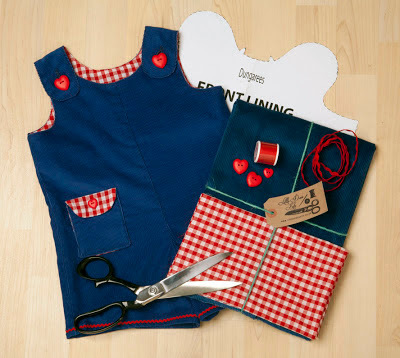 Little Dress Kits offers sewing kits that include all materials to make clothing for babies and toddlers. Everything, my friends. Fabric, pattern, thread, buttons and any other notion needed. I always seem to leave the fabric store without thread when I start a new project. No chance of that here. And one of the most genius aspects of her kits are the pattern pieces. They are adhesive. You peel off the pattern piece and stick down on your fabric. No pins required. My mind was blown. I requested the Sweetheart Dungarees Kit. How adorable is that little pocket? It was the pocket that swayed me. J and I giggle about pockets on baby clothes. What do babies put in their pockets? Binkies? Blocks? Spare change? Anyway, I loved the blue corduroy and red gingham combo. And the heart buttons, of course. Super cute. I just realized from my photos that I left off the ric rac. Will have to remedy that! Ok, it's way big on baby Jane right now. But, gah! How cute is this baby? That dimple in her chin just slays me. We're not sure where that came from, either. But I love it. The kit came with all the supplies I needed. I only had to supply the sewing machine and the time. Katie offers a variety of kits aimed at different sewing levels. 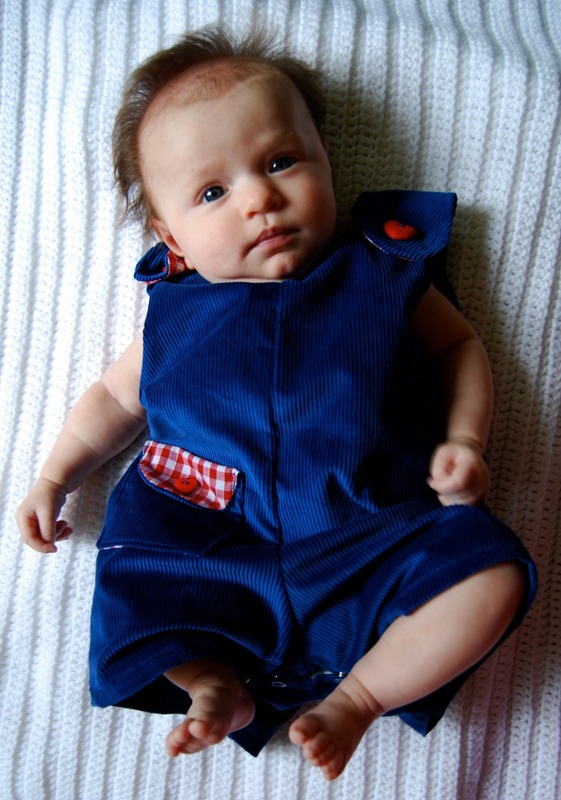 The Sweetheart Dungarees Kit is a level three kit, but truly I think a beginner could get by just fine. The instructions are fantastic and super in depth. I did make one change. I change a lot of diapers. I mean, a lot of diapers. So I added snaps in the crotch seam instead of sewing it up. I did add to the seam allowances to accommodate the snaps; a half inch to the front and a full inch to the back (sorry that's not metric!). 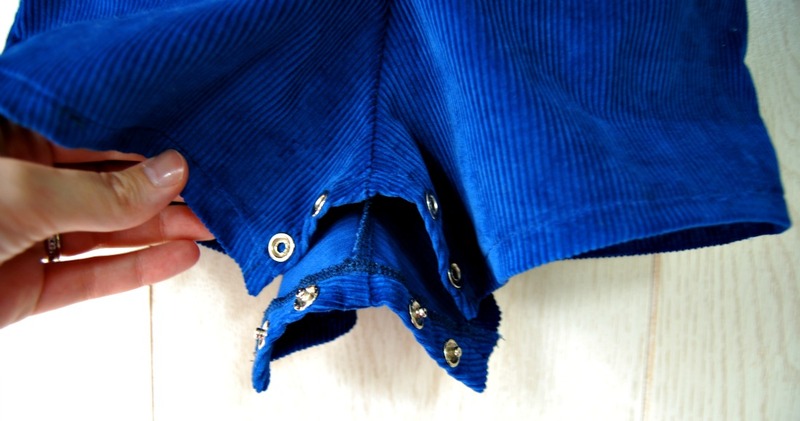 I added more to the back crotch seam to allow overlap to the front. Worked like a charm. Also if you are wondering about sizing, this is the 0-6 month kit. I realize it's big, but she'll grow in to it. Probably sooner than I would like. For reference, Jane is about twelve pounds right now. Guess who wants to sit up like a big girl? Now here is the best part. You, my friends, have a chance to win a Little Dress Kit yourself! Katie has kindly offered a kit to one lucky reader. All you have to do is hop on over to the Little Dress Kit website and tell me in the comments which kit you would like to make. I will choose a winner on Sunday, July 14th. If you would rather go ahead and order yourself a kit or two, Katie has also offered 15% off using the code LJSEWS15 for the next week. Thanks so much for the opportunity to try out one of your kits, Katie! It was perfect timing for me and baby Jane.